Whether your next stained glass or leaded glass project involves new construction or restoration, please contact us. We would like to review the details of your project and show you how we may assist you. English Tudor Cottage Glass Works offers the artistry of Dale Barden. Specializing in providing personalized stained glass services for Sacramento and the Northern California area since 1976. Dale Barden has been helping clients turn houses into homes through the addition of the special magic that the design and texture of custom stained glass windows add to a residence. Over her past 36 years of experience, the wide range of projects includes a broad base of residential, commercial, and ecclesiastical commissions. 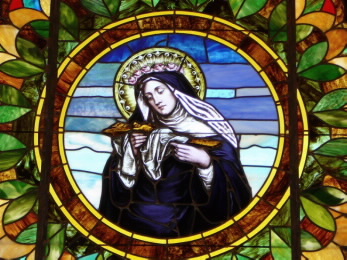 Initially, her specialty was in the custom design of architectural stained glass windows for residential applications, but over the years, the focus of her work expanded and began to include restoration work, as well. She has also collaborated with interior designers to assist in realizing their clients' dreams though the creation of special designs in stained glass for interior features within the home, such as special focal point windows, pantry doors, interior transoms, and kitchen cabinets. One of the key features that Dale Barden cites for her continued success over the years has been the sincere interest that she takes, not only in the project, but in her clients, as well. The process begins when she, personally, goes to the location where the stained glass window is to be located to meet, directly, with the client. During this time, more than the specific physical requirements for the panel are learned. This interaction with the client will include truly listening to the atmosphere that is to be created by the addition of this element of artistry in stained and/or leaded glass. Seeing the surroundings in which the stained glass is to be located is important to get a sense of the design and shades of colors to be used. It is also helpful to note how sunlight will play upon the glass when it is installed in place. This has proven to result in designs that are pleasing over decades of time. Personal attention continues as a stained glass project proceeds. The after the initial meeting, the client will be presented with a preliminary design for the project. It is during the review of the preliminary stained glass design, that the direction of the final design will be established. This step is essential to ensure that both client and artist are able to visualize and communicate their respective visions for the finished stained glass project. Then we proceed to producing the actual working design which will be used for guidance during the construction of the project. When that is complete, the glass will be selected and presented for approval. So before any construction work begins, the client has been thoroughly involved in the design and glass selection process. All of this personal involvement has proven over the years to result in a satisfying finished project. The true reward for Dale Barden always is the special satisfaction that she sees in a client's eyes when the finished piece is installed in its intended location. In addition to residential stained glass projects, English Tudor Cottage Glass Works has also done numerous commercial projects, as well. Probably the most recognizable would be the restoration of the entry doors for the exclusive Sutter Club near the State Capitol, in Sacramento. These doors were originally constructed by Bert Leeman of Sacramento and utilized a unique technique of utilizing flowing solder to hold individual roundels in place. 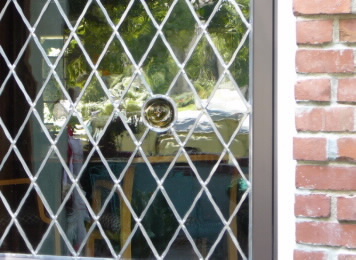 This was another challenge where English Tudor Cottage Glass Works was able to replicate the original methods utilized and restore the panels to their original appearance. Another area of work opened up when English Tudor Cottage Glass Works was commissioned by Monsignor Robert Walton of the Catholic Diocese of Sacramento to reproduce the personal crest of Bishop Weigand in stained glass to be installed in the Bishop's residence. This initial contact led to the further commissions of new designs and restoration work for the Diocese of Sacramento. Four beautiful, ten foot high, colorful ribbons of inspiration were designed for installation into the Chapel at St. John Vianney House, in Sacramento. What was particularly pleasing about this project was that the windows were constructed from materials that Dale Barden noticed during her first tour of the construction site. She saw beautiful, old pieces of hand-blown colored glass that had originally been installed in a cupola. The material was about to be discarded, but she rescued it and used it as a basis for her design. This resulted not only in incorporating a traditional element in the new windows, but also wound up producing a substantial cost savings for the client, as well. Additional commissions have resulted in new stained glass installations at Holy Spirit Church, as well as additional projects for Msgr. Walton producing a pair of stained glass panels commemorating the seventy-fifth anniversary of founding of Sacred Heart Church in Sacramento. The Diocese of Sacramento has also retained the services of English Tudor Cottage Glass Works to aid in the restoration of various projects, as well. Dale Barden's first restoration project involved the extensive repair of the multitude of small panels at St. Philomene Catholic Church in Sacramento. This project encompassed a broad range of restoration techniques. In addition to the usual repairs, the panels needed to have replacement glass selected to match the fifty year old existing glass for both color and texture. Many of the panels had individual panes with hand-fired designs that were damaged as well. These pieces were delicately removed and personally hand carried to one of the nation's finest specialists in the reproduction of hand-painted designs on stained glass. There, the original designs were replicated on the hand selected matching glass, and then the finished pieces were, again, personally picked up and presented for review and approval before incorporating them into the restored panels. This personal attention to detail and service resulted in panels that were restored back to their original condition and appearance. The crowning achievement for English Tudor Cottage Glass Works has been Dale Barden's contribution to the restoration of the Cathedral of the Blessed Sacrament in Sacramento, California. As the project was nearing completion, the general contractor for the project ran into a problem. As the painters began restoration of the framework surrounding the windows above the three sets of main entry doors, they refused to proceed because of the delicate state of the 110 year old windows. The painters were afraid that the slightest touch might send the windows crashing onto the granite entry steps, below. Vanir Construction contacted English Tudor Cottage Glass Works at this point to evaluate the condition of the stained glass windows and to see if anything could be done. When Dale Barden inspected the windows, she was immediately struck by the beauty of the design and the materials that were incorporated into this bit of history. The contractor had been told that the only way that the windows could be repaired would involve complete disassembly and reconstruction. This would have taken months beyond the scheduled completion date of the Cathedral. Calling upon her extensive experience that she had acquired over the years, Dale Barden gladly accepted the project. She knew it would be a challenge, but that it would also be a commission that she would be able to point to with pride. Undaunted, even when faced with the dilapidated and fragile condition of the eighteen once magnificent panels, she proceeded to make all of the necessary repairs without having to take the additional time-consuming and expensive steps of having to totally disassemble and re-create the windows. All of the defects were corrected, and the end result was that these pieces of history were back in place, on time, and once again reflecting their true colorful glory at the main entrance of the Cathedral of the Blessed Sacrament in Sacramento. From the beginnings of her career in stained and leaded glass, Dale Barden has always enjoyed commissions that challenged her creativity and abilities. Her initial project involved the design and construction of forty-seven individual custom designed glass panels for a residence in the Sierra Oaks area. That project included one panel comprised of over one hundred and seventy pieces, depicting an azalea shrub. Over the years, she has consistently been perfecting her craft, as well as adding new skills and techniques to her repertoire. Dale Barden has always taken special pride in the quality of her solder joints, taking special care to see that each, individual solder joint lays flat on each leg of the came. Dale has also developed a proprietary method to aid in the restoration of bowed panels. Through the utilization of her technique, she has been able to correct and restore panels that others would have deemed non-repairable. Dale has also incorporated the technique of individually hand-carving the lead came to add to the Old World charm of her designs. The adzed appearance of the lead adds a special charm and patina to designs where it is appropriate. In an on-going effort to bring an ever-expanding range of allusion to her designs for her clients, Dale has traveled extensively throughout France & Germany, visiting historical sites in order to view the Old World designs and techniques that have been incorporated in stained and leaded glass over the ages. Sharing these experiences with her clients, through the medium of her designs, has added even more enjoyment to the projects. In addition to her excellent reputation for a good eye for design and pleasing color selections, Dale Barden also takes a professional approach to the details of each and every project. She provides a complete estimate specifying the details of the work to be performed, the materials to be used, the time that the project will take to be performed, the price for the project, and the terms and conditions. This is done to clearly spell out exactly how the project will proceed so that her clients are always fully informed with no hidden surprises. This communication between artist and client has been part of her continued reputation for pleasing clients with projects that are not only completed in a timely fashion, but are also have incorporated outstanding service, as well.